Shakespeare wrote brilliant plays. Younger children may not be ready to experience them in their original form, but they can certainly enjoy the stories. And if they become familiar with the stories early on, it’s a much shorter step to appreciating them later in the bard’s own beautiful words. What was for me at senior school a relentless chore of trying to grasp plot among a load of archaic words, can instead – for those already fans of the stories – be a fun decoding process which quickly gives way to an appreciation of the subtleties, humour and beauty of Shakespeare’s language. We’re using The Shakespeare Stories, a set of 16 plays which I got from Amazon for about £15. 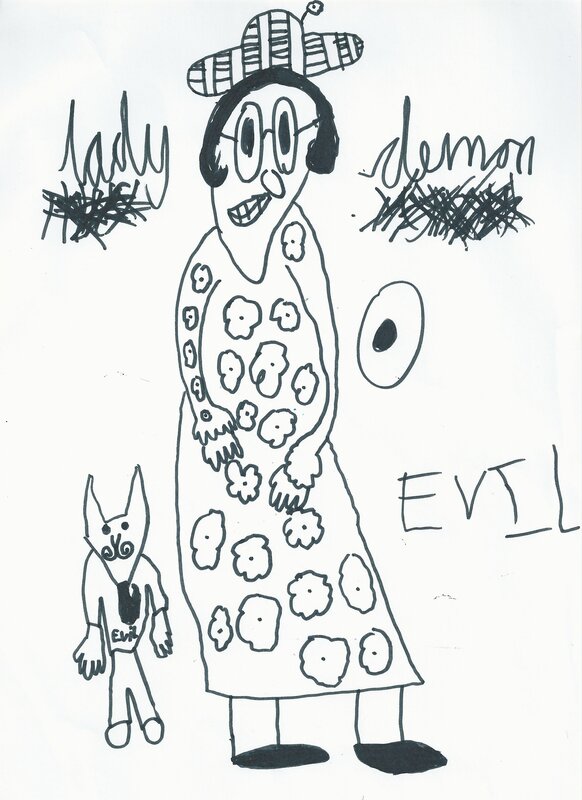 Each tells its story in engaging language and contains, at the start, a sketch of the main characters. Most can be read aloud in less than thirty minutes. Not every scene is included, of course, but the main parts of the story are covered. Monday is our Shakespeare day. We read aloud a story, either entirely in one session or over a couple of weeks, then we discuss it. After Hamlet, our discussion focused on C gleefully adding up the number of characters murdered in it. The following week we watch a thirty minute film version of the play in the form of Shakespeare: The Animated Tales (available free on YouTube). I like these because they use mostly original language, and have subtitles. 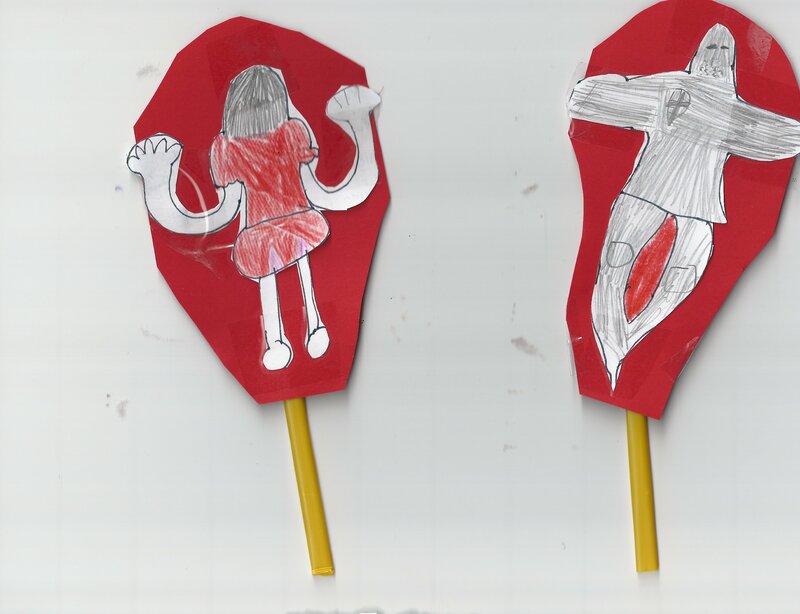 Next C (8) does a mini-project of her choice, to consolidate her understanding of the play. 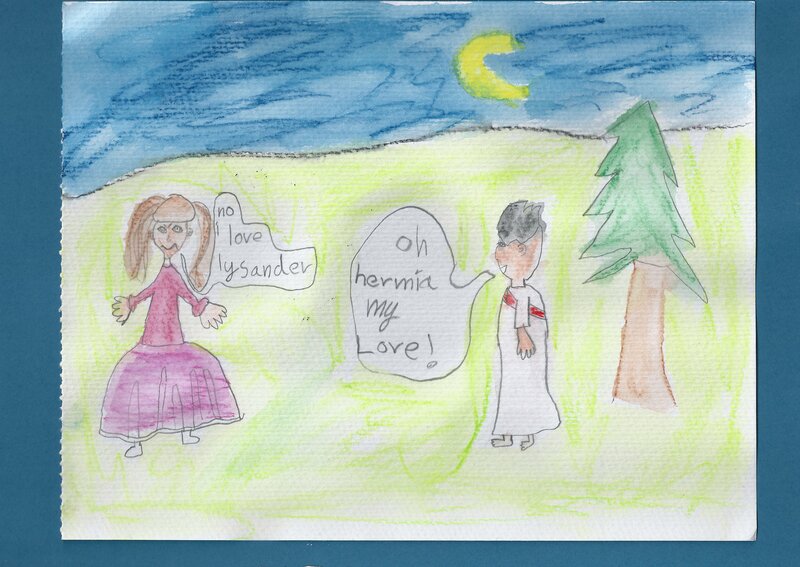 For example, when we did A Midsummer Night’s Dream she made a watercolour crayon picture (see above). For Hamlet, she chose to make puppets of Hamlet and his father’s ghost, wrote a short script and acted it out while I recorded it on my iPhone. All very spontaneous, easy and fun! Copywork – I usually make a worksheet or two containing quotes from our current play to include in C’s weekly copywork. 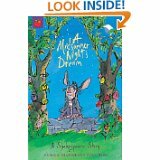 There are many re-tellings of Shakespeare available, so it should be easy to find one to suit your children and educational style. 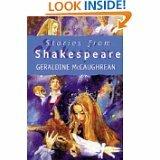 C uses the beautiful illustrations in Geraldine McCaughrean’s Stories From Shakespeare as inspiration for her projects. One nice feature of this book is the sidebar quotations from the plays. I anticipate using the stories themselves next time around. We have read one story from this book and both C and J(6) enjoyed it, but for now we prefer the brevity and accessible style of The Shakespeare Stories. Another book we’ll no doubt come back to is Mary Lamb’s Tales From Shakespeare, which contains concise re-tellings of twenty plays. Mr. William Shakespeare’s Plays tells the stories of seven plays in comic strip form. I’m awaiting a copy of this one so I can’t comment in detail yet but I like that the plays are “performed” at the Globe Theatre of Shakespeare’s day. The sequel, Bravo, Mr. William Shakespeare! presents a further seven plays. For much more on studying Shakespeare in your homeschool (or anywhere! 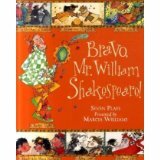 ), including oodles of fabulous links to free resources, see Jimmie’s Shakespeare For Children Squidoo lens. 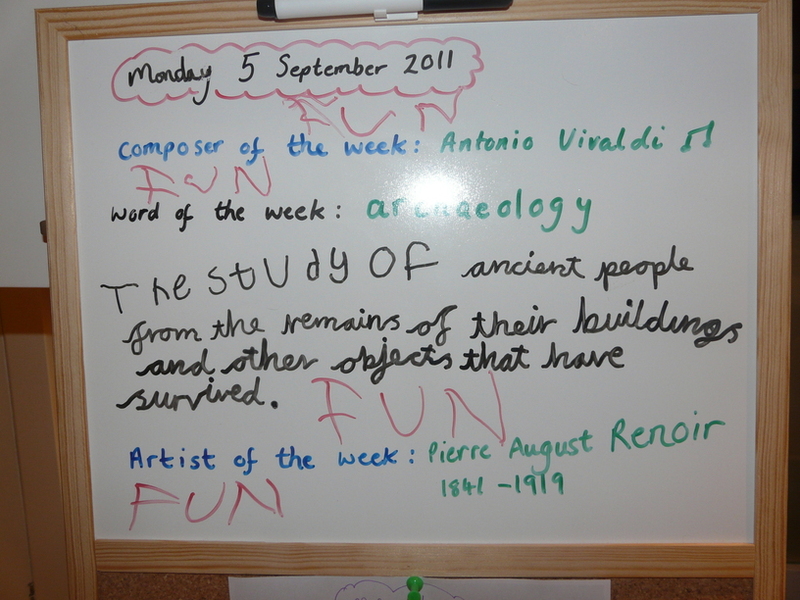 We use living books in our homeschool for most subjects: history, science, music, art, and even maths. Books which are passionately written, bring their subjects to life, and are as enjoyable to read – for both adults and children – as they are educational. But a living book to teach the names and functions of the parts of speech? Surely not! 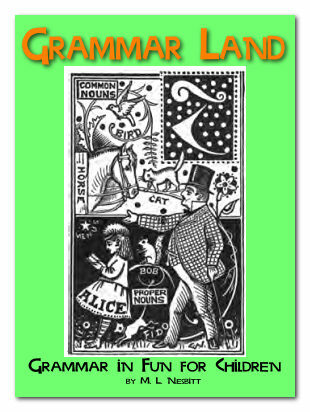 Enter Grammar-land – 135 years old and brimming with more life than any twenty-first century workbook ever did! The story takes place in – you guessed it – Grammar-land, “a place every bit as real as Fairy-land, and much more important”. Grammar-land is ruled over by stern, old Judge Grammar, who is “far mightier than any Fairy Queen, for he rules over real kings and queens down here in Matter-of-fact-land”. As some of the Parts-of-Speech are richer (have more words than) the others, they are given to quarrelling, and one day they make so much noise that they wake Judge Grammar from a very comfortable nap. In subsequent chapters, Judge Grammar cross-examines each Part-of-Speech in turn to find out which words properly belong to it, and how those words may be identified. To help the children of Schoolroom-shire in their role of keeping account, Judge Grammar sets a short practice exercise at the end of each chapter. Jessica Cain has generously shared beautifully formatted versions of the exercises here. Listening to one chapter of Grammar-land per week has been a fun part of our Grade 2 English curriculum this term. I’m not a fan of repetitive grammar drills or rote-learning of lists of prepositions and the like, so the rest of our grammar curriculum consists of good quality literature, daily copywork and games like Mad Libs. C (8) is going to start learning Latin soon (we’re both loving the look of Visual Latin) and what she’s learning from Grammar-land is a great foundation for beginning to understand concepts like adjective agreement and verb declension. You can find the complete text of Grammar-land free online, here, for example, and there is also a beautifully narrated free audio version. I came across Grammar-Land among various other gems I bought as part of a bargain package from Yesterday’s Classics. It’s also available from Amazon. Now, to find a living book on punctuation. Suggestions welcome! C (aged 8) began homeschooling a year ago. 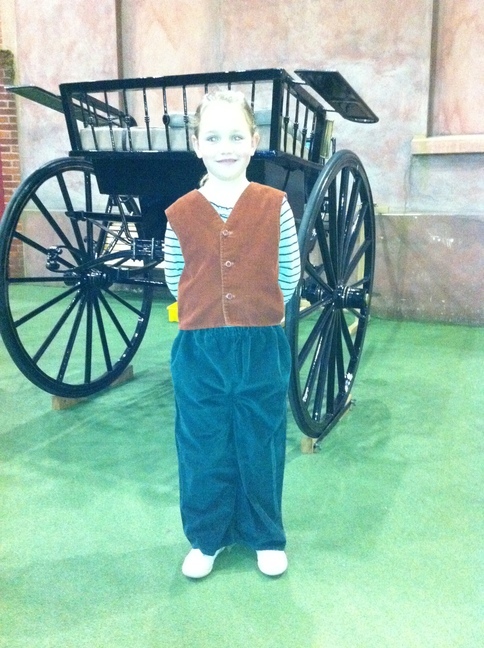 Words are a strong suit for her – she is very articulate, has great cursive handwriting, and reads quickly and fluently. She also has strong opinions about what she does and doesn’t want to do, and one of my challenges is to find a careful balance between boring her and demanding too much! to provide access to a steady stream of resources to help satisfy her appetite for words. I mentioned in my post about our Grade 1 English that I am quite “unschool-y” about language arts; I want these skills to be learned as much as possible in a real-world context, and there are plenty of opportunities for that to happen. It’s important for all writers to keep the mechanics of writing from getting in the way of creativity, and this is especially true for children, for whom the gap between the two skill-sets is larger than for adults. By “mechanics” I mean not just the physical process of handwriting but also the niceties of grammar, spelling, punctuation etc. I’m not under-estimating the importance of getting those things right – as a former lawyer I’m all too aware of how a misplaced comma can change the whole meaning of a sentence – but I also know that sometimes it’s best just to get the words down on paper and then tidy them up later. 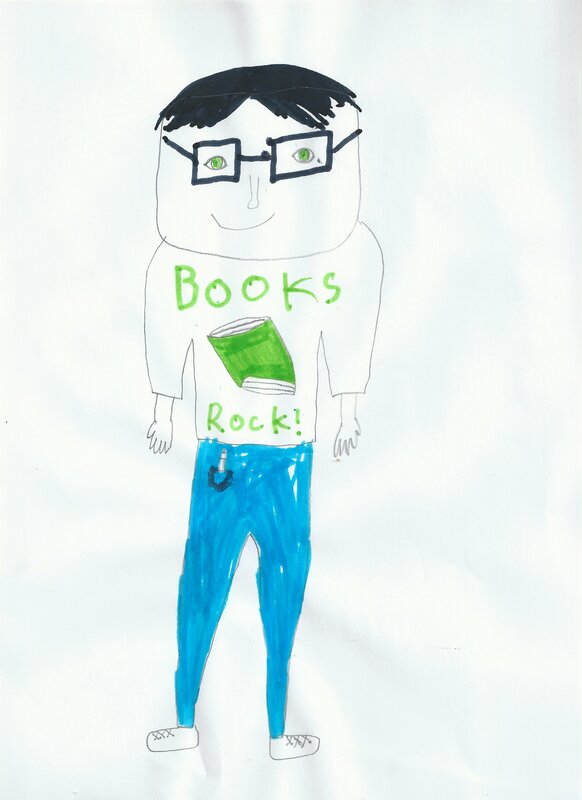 I love that the very first exercise in the Nanowrimo Young Writer’s Program (which C and I dabbled with and will return to later this year) is to draw a picture of your inner editor and then lock him/her/it somewhere out of reach where they can’t intrude on the creative process! Daily Paragraph Editing provides near-real-world grammar practice. Each unit is made up of four related paragraphs containing various spelling and grammatical errors. Different genres of writing are covered, such as non-fiction, biography, realistic fiction, historical fiction. I print out the relevant paragraphs from the e-Book, and C puts on her editor’s hat and hunts for all the mistakes the “copywriter” has made, keeping to hand the book’s list of standard proofreading marks and checklist of proofreading errors while she works. I look ahead to see what’s coming up, and discuss anything new with C in advance. I stay close by while C works so she can raise any queries with me as she goes along. If I notice that she’s unsure about a new concept (for example, plural possessive apostrophes recently) I plan a bit more practice on it over the next few weeks. Both C and J love mad libs. They’re such great practice for both creativity and knowing the parts of speech, yet it doesn’t feel like “school” at all – win win! We’ve been using Best Of Mad Libs . I wasn’t sure whether to use a specific spelling program with C at all as she is such a naturally good speller. 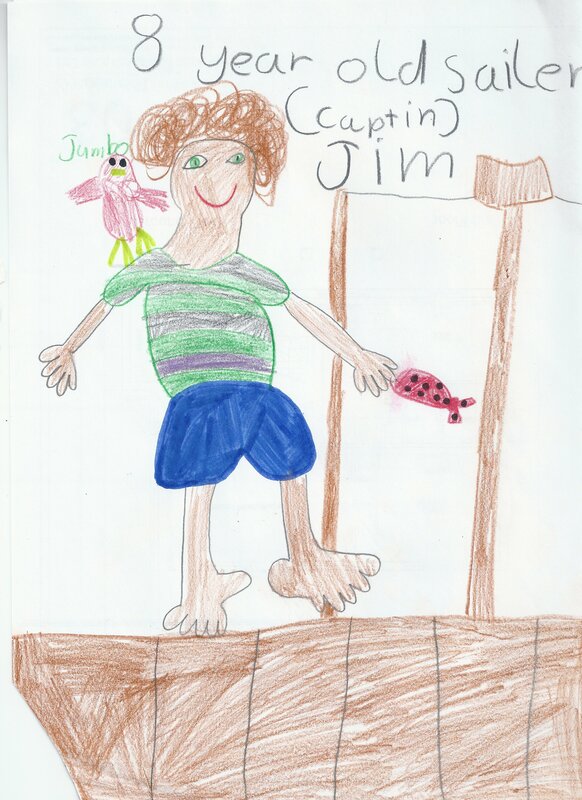 But there are words that she misspells and although these might naturally be picked up over time, I followed Jimmie’s tip and invested in Spelling Power, on the basis that it will last right through school and I can use it with J as well. Spelling Power has placement tests so the student begins the program at exactly the right level, and C seems to be really enjoying it so far. Her biggest complaint is that she gets so few words wrong on the pre-tests, she doesn’t get to do many of the fun exercises like spelling out words with her finger in a tray of salt! We’ve also been reading aloud Spilling Ink, a light-hearted look at the creative-writing process by two female novelists, which is a fun and nicely aligned with my motto of feeling good around “school subjects”. C reads a lot on her own – mostly library books and books on her new Kindle. She also listens to library audiobooks and we listen to Audible purchases together – we recently finished Anne Of Green Gables and we’re onto Anne Of Avonlea. I always read aloud a chapter book to C and J together as a bedtime story. This term I plan to do more reading aloud of good quality literature and great stories – stories from Shakespeare, Homer and other classics – as part of our school day. I’ve just subscribed to the Evan-Moor subscription service Teacher-Filebox which gives unlimited access to all Evan-Moor’s eBooks. (30% off via the Homeschool Buyers Co-op.) I’m looking forward to exploring Filebox. For language arts we already use Daily Paragraph Editing (C) and Building Spelling Skills (J), and it looks like there are some good grammar resources there, like Language Fundamentals. More about this when we’ve had a chance to play with it some more! I’d love to hear of any extra resources people use that we might enjoy. 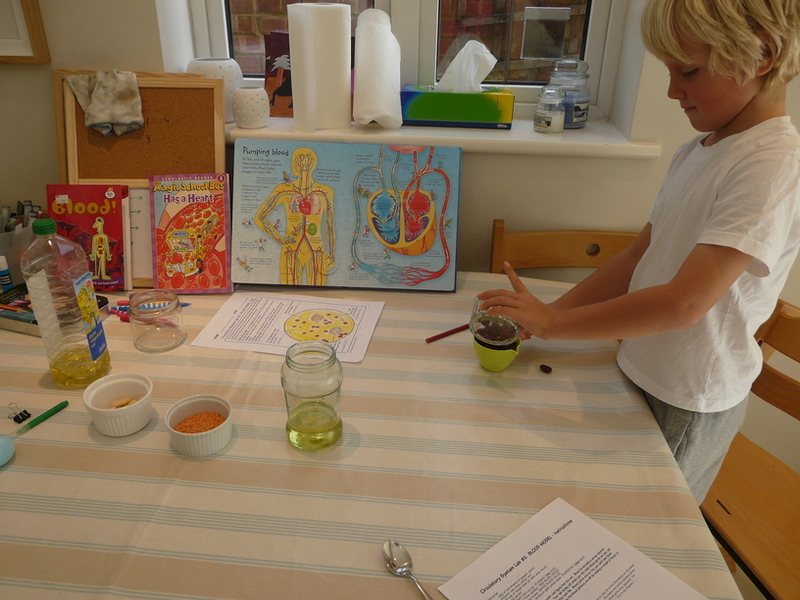 We’re really enjoying learning about the human body as part of our REAL Science Odyssey Life (level 1) curriculum. The combination of the hands-on activities in the curriculum, great living books and the wonderful resources available on YouTube really brings the human body to life (ha ha!). Today we found out about blood. 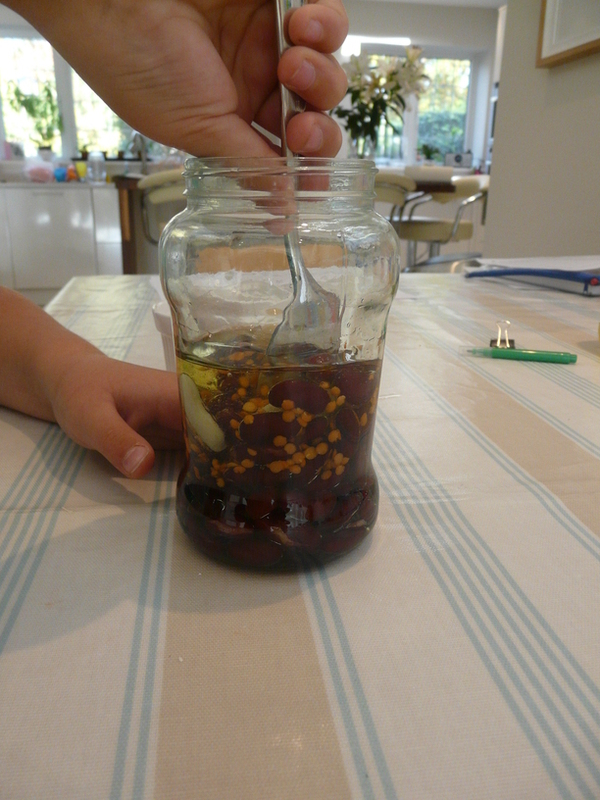 We made a model of blood using half a cup of vegetable oil (for plasma), half a cup of red kidney beans (red blood cells), five butter beans (white blood cells) and a tablespoon of dried lentils (platelets). All stirred up in a jar this was a great way of learning how, although blood looks like a homogenous red liquid, it is actually made up of several different components, appearing red because of the red blood cells. We talked about what each component does. 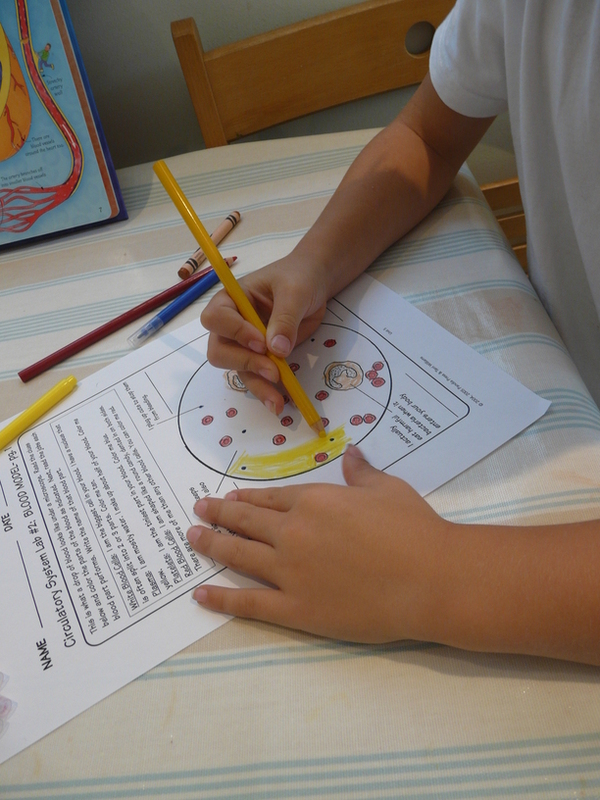 The children coloured and labelled diagrams of the blood model, and we read The Magic School Bus Has A Heart (highly recommend – we love the Magic School Bus!). We also looked at Blood! which is a nicely illustrated and very comprehensive early-reader style reference book but was less of a hit in this living-books-loving house. Usborne’s flap book See Inside Your Body has some great pictures of the circulatory system. And we’re off!! After months of daydreaming, planning and choosing resources for this homeschooling term, today we actually started using them! 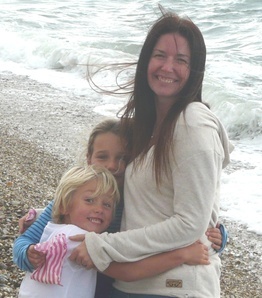 Taking the advice of experienced homeschoolers (I love homeschool blogs! 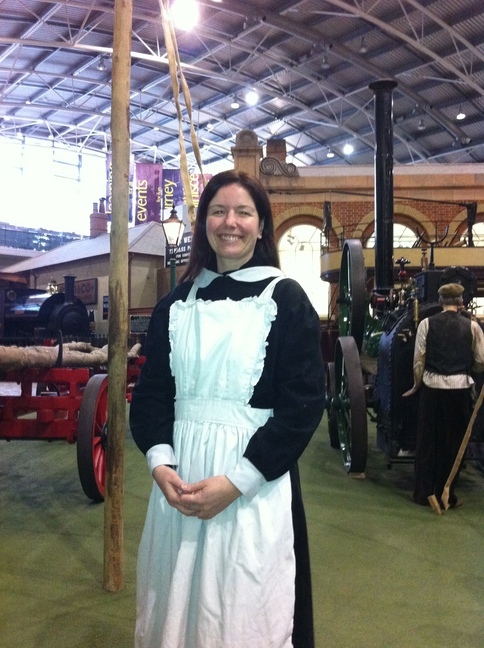 ), we are easing back in gently, so just a bit of maths and history today. And I got to play with my new whiteboard! 🙂 Which will hopefully help me strike a balance between complete freewheeling and having a bit of structure to our days. As C very perceptively put it , “if we don’t know what’s planned, we make our own plans”. Not that that’s necessarily a bad thing – I want C and J to have LOTS of free time to find and explore their own interests and passions – but I also want to provide some signposts to point the way to things I think they might enjoy and find useful. A few ready-made curricula and a modicum of planning should help with that intention, and keep me accountable! I also like knowing when the pro-active part of my role is “done for the day”. Of course I’m still available to the children after we’ve ticked off the day’s scheduled “subjects”, but without any kind of plan I have a tendency to spend the whole day in a state of mild anxiety, offering “suggestions” from that place – which never ends well! 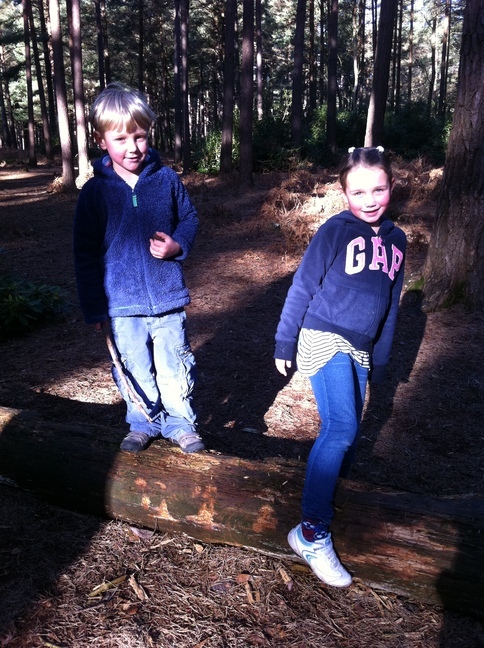 Inspired by the fun we recently had at Centerparcs, this week I’ve been attempting to strike a balance between stimulating new experiences and the comfort of our normal home routine. 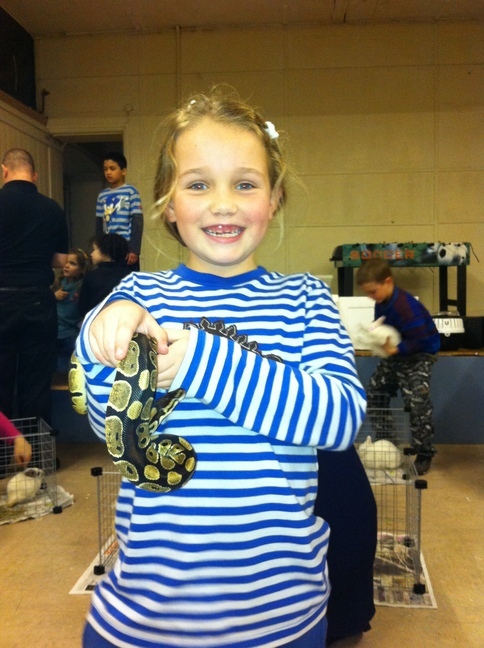 On Monday we went to our weekly London home education group, where we were this week joined by a menagerie of snakes, spiders and rodents. Then, yesterday, we recreated a few of my favourite elements of Centerparcs with a morning walk in Bracknell Forest and then a proper, (my) hair-wet, session at the local swimming pool in the afternoon. Usually I do 15 minutes with the children after their swimming lessons, sporting a bright yellow silicone hat to save the need for a subsequent hair-wash. A hair-wet swim is so much more fun than the bobbing-on-the-surface version, especially as C and J spend most of their time underwater. I even did some lengths of front crawl and breast stroke when the children joined their classes – my upper body felt satisfyingly “exercised” when I woke this morning! After such an active start to the week I was tempted to stay at home today, but Wednesday is our best day for field-trips and we’d been intending to visit the Milestones living history museum in Basingstoke for some time so, fuelled by my new intentions, off we went. We had a great day; Milestones had something for each of us. 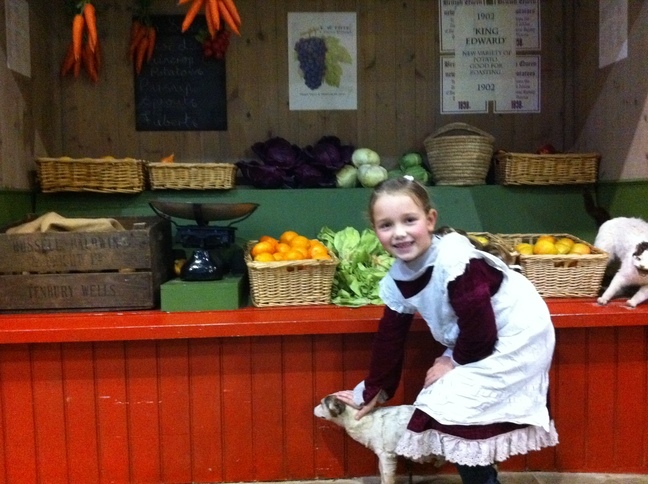 C revelled in dressing up in an array of Victorian and Edwardian costumes (actually I quite enjoyed that too!). 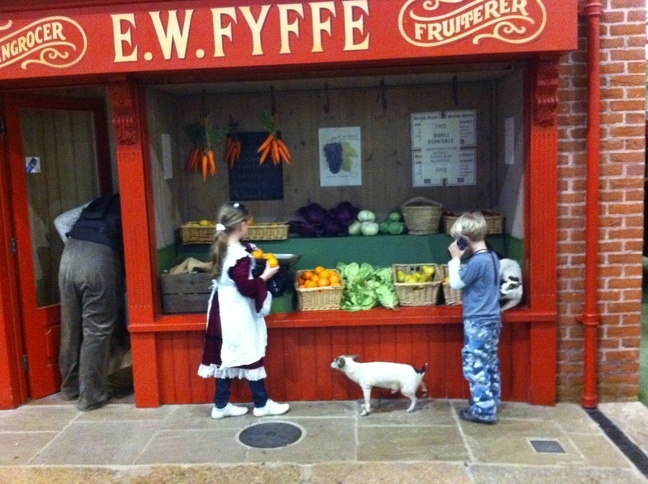 The exhibits showing how real people lived fascinated me – the tiny “workman’s cottage” complete with Victorian washing tub (“copper”), mangle, and outside privy, and the shops filled with ordinary objects so evocative of their times. J, meanwhile, was thrilled to be given sole use of an “Opus Click”, a small audio-visual gadget which kept him utterly captivated hunting for exhibit numbers and solemnly listening to the accompanying commentaries as C and I ooh-ed and ah-ed and played dressing up. Tomorrow, a relaxing day at home. My friend S has been trying to get me into the iPhone version of Scrabble, “Words With Friends,” for months, but I’d been resisting (the old enemy perfectionism again. People have run marathons waiting for me to take my turn at the board version). But yesterday J (5) reminded me that we had started a game several weeks ago (played between him on our iPad and me on my iPhone) and asked if we could continue it. And so began Scrabble-mania in our house. Rarely have I seen J give so much sustained attention to combinations of vowels and consonants, eagerly arranging his letters into the words I suggest, his love of games and in particular scoring points overcoming his aversion to anything that smacks of that Curriculum subject “Literacy”. We played yesterday at home, in the hairdressers, and in the car waiting for C’s drama class to finish (J even put a word of his own down when I went in to collect her! ), and carried on at breakfast this morning, when C joined in on her iTouch. The three of us spent a large and happy part of the morning playing simultaneous multiple games with eachother in every possible permutation, while I drank tea and indulged my perfectionism in the knowledge that this is how home ed is “supposed” to look. I haven’t even been deterred by finding the game – when looking for a link to insert into this post – listed under “Apps For Mums And Dads”! Got to go now, S, my sister and my husband are all waiting for me to take my turn.